FPWR’s 2017 Scientific Day was held in conjunction with the FPWR annual conference on Thursday, August 24th in Indianapolis, Indiana. 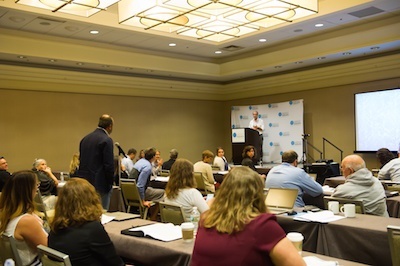 Approximately 75 people attended, including scientists, families and professionals from the pharmaceutical industry. 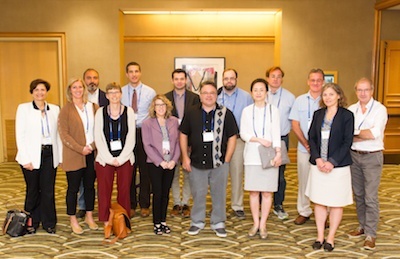 The meeting included 16 oral presentations and 6 posters, the majority of which represented FPWR funded projects. They covered a variety of PWS science topics including genetics, cell biology, clinical studies, mental health and more. The day was marked by vigorous discussions, cross-fertilization of ideas, and the formation of new collaborations. All of the Scientific Day presentations are briefly described below (with abstract titles in bold), and you can download the abstracts here. Dr. Stamm (U Kentucky) led off with a presentation of his lab’s work delineating the function of the SNORD116 genes. Their studies suggest previously unappreciated roles for SNORD116 in fine tuning RNA molecules by influencing “microexon” selection, and regulating the stability of RNA transcripts. [SNORD116, missing in PWS, regulates mRNA stability of immediate early genes]. Dr. LaSalle (UC Davis) followed with a her lab’s work on Snord116, analyzing the genes’ role in regulating circadian rhythm, specifically focusing on epigenetic changes to DNA that occur in a 24 hour period. Her studies suggest that rhythmic methylation of DNA may relate to some of the abnormal sleep/wake/metabolic problems that have been noted in PWS. [The PWS Snord116 imprinted locus in the epigenetic regulation of diurnal metabolism]. Dr. Kim (Duke U) presented work from the Jiang lab identifying small molecules for gene activation in PWS. This group has identified a molecule that activates the PWS region genes on the maternal chromosome, and improves survival in one of the PWS mouse models. Their lab is continuing to develop this approach, assessing safety and efficacy in mice; and is exploring new CRISPR-based methods of gene activation. [Targeting the histone methyltransferase G9a activates imprinted genes and improves survival in a mouse model of PWS]. Dr. Potts (St Jude) has been exploring the cellular changes that occur when the PWS-region gene, MAGEL2, is lost. His studies show that cells without MAGEL2 have abnormalities in a normal cellular process of protein recycling (ubiquitination) and also show defects in the proper ‘trafficking’ of proteins to different places in the cell. [Biochemical and cellular function of the PWS gene MAGEL2]. Dr. Wevrick (U Alberta) followed up on this line of investigation with work from her lab showing that a particular protein important in weight regulation (the leptin receptor) is normally sorted and regulated by the PWS-region genes MAGEL2 and necdin, and that when these genes are lost (as in PWS) the leptin receptor is not present at the cell surface in normal quantities, which may underlie the excess fat mass in PWS. [The PWS proteins MAGEL2 and Necdin regulate receptor cell surface abundance through ubiquitination pathways]. Dr. Polex-Wolf (U Cambridge) presented work from the Yeo lab aimed at improving the Snord116 mouse model of PWS, which currently does not become obese. Their work employs a genetic manipulation to delete the Snord116 gene after the mice have been born, and they have been able to induce hyperphagia/obesity in some of these mice, which could pave the way for a better model in which to test anti-obesity drugs [Snord116 deletion in the murine mediobasal hypothalamus recapitulates the hyperphagia of PWS]. Dr. Zigman (UT Southwestern) discussed the role of ghrelin in PWS. His lab has been examining whether ghrelin might have a protective role, helping to regulate blood sugar in the period shortly after birth. Using mouse models of PWS with manipulation of the ghrelin system, he showed evidence that ghrelin helps newborn PWS mice survive and grow. [Ghrelin receptor deletion increases morbidity and mortality in a PWS mouse model]. 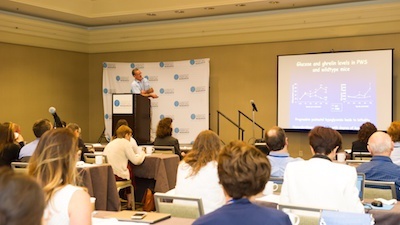 Dr. Nicholls (U Pittsburgh) updated attendees on his work engineering a cell-based system to explore deficiencies in hormone secretion associated with PWS. His group has shown that PWS pancreatic cells don’t secrete insulin and glucagon normally, and he is engineering a cell line that will be useful in better understanding the cellular basis of this problem, and could also be used to screen drugs to correct this defect [Pancreatic beta-cells with CRISPR/Cas9-engineered 3.16 Mb deletions recapitulate the insulin secretory deficits in PWS]. Dr. Kurrasch (U Calgary) showed fascinating video of microglia cells, the immune cells of the brain, in the hypothalamus of Magel2 deficient mice. Increasing evidence suggests that they these cells are central to the neuro-inflammation associated with obesity, and Dr. Kurrasch’s work suggests the cells are activated and overly abundant in this PWS mouse model. [Reactive microglia in the hypothalamus of Magel2-/- mice]. Dr. Tucci (Instituto Italiano di Tecnologia) discussed his group’s work on specific brain networks (melanin concentrating hormone, MCH, and orexin) that regulate feeding and sleep. Using the Snord116 deficient PWS mouse model, he showed evidence that both systems are altered in PWS, suggesting that these might be good targets for interventions. [The role of melanin concentrating hormone (MCH) and orexin/hypocretin (OX) neurons in the pathophysiology of PWS]. Dr. Reiter (U Tennessee) reported on the findings of his “tooth” study. Using neural cells derived from PWS ‘baby teeth’ stem cells, he analyzed gene expression differences between PWS cells and typical cells. This study focused on “microRNAs”, a class of regulatory RNAs. One specific microRNA (miR-495), which is important in neuronal migration, is expressed at abnormally high levels in PWS. [Differential expression of miR-495 in PWS neurons]. Dr. Kimonis (UC Irvine) shared data from the Rare Disease Clinical Research Network (RDCRN) study regarding maternal and neonatal findings in 355 cases in the dataset. Consistent with more recent reports, and data in the Global PWS Registry, the commonly cited “70%” PWS by deletion seems to be an overestimate. Sixty-one percent of RDCRN cases were deletion, while 36% were uniparental disomy (UPD) and 3% had an imprinting defect. Additional data on maternal age, pregnancy and neonatal complications were presented. [Perinatal features and genotype in a large cohort of 355 patients with PWS]. Ellen Dorenberg (Case Western Reserve U) from Dr. Dimitropoulos’ group presented their initial findings examining children with PWS, age 3-5 who were enrolling in a study to improve play skills. The baseline assessment demonstrated that preschool children with PWS did not engage in play with props as much as typically developing children when left to do so on their own. Social cognitive challenges were apparent in all children with PWS, but may be more pronounced in the UPD subtype. These findings provide a strong rationale for play-based interventions to improve social cognitive function. [Establishing baseline characteristics for social cognitive processes in preschoolers with PWS]. 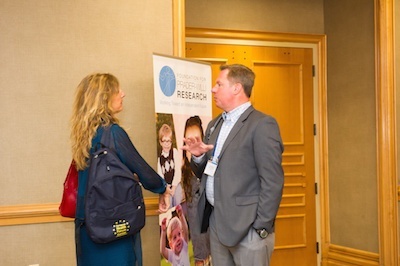 Dr. Roth, on behalf of PWS Clinical Trials Consortium, presented the findings of a Caregiver Burden Survey, which measured the level of burden and quality of life for caregivers of children and adults with PWS. Caregivers reported a high burden of care, which negatively impacted the caregiver’s mood, anxiety levels, sleep and ability to work. The study suggests a critical unmet need in caregivers of individuals with PWS [High levels of caregiver burden in PWS]. Dr. Holland (U Cambridge) concluded the oral presentation program with an update on his ongoing clinical trial investigating the use of a vagus nerve stimulator (VNS) to improve challenging behavior in adults with PWS. The study is a follow up of a small trial this group previously conducted, which suggested that VNS might decrease temper outbursts and improve behavior in persons with PWS. The is a long term (1-year study) and Dr. Holland discussed some of the challenges of conducting the study in this complex population over this length of time. Baseline data has been collected in almost all participants, and data on the intervention is being collected currently. [Trial of transcutaneous vagus nerve stimulation as a treatment for challenging behavior in PWS]. 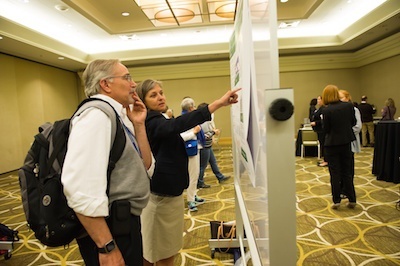 An evening reception highlighted additional research in the form of poster presentations. Posters included a report from the Wevrick lab on the positive effects of diazoxide treatment on weight and body composition in a mouse model of PWS; additional work from the Stamm lab on the role of Snord115 in mediating serotonin receptor 2C biology in the pituitary region of the brain; studies from the Tucci lab on the role of temperature in regulating the sleep-wake cycle, as well as effects of the wake-promoting drug pitolisant in a mouse model of PWS; and updates from FPWR on the PWS Preclinical Animal Network and Global PWS Registry.